An audio interface isn’t 100% necessary as a new producer. It all depends on what you’re trying to do! 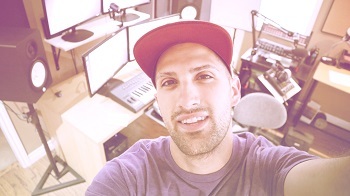 If you are just making beats but not recording with microphones, you may not need an audio interface. Just selecting the ASIO4ALL audio driver will be sufficient for your production needs! But, if you’re wanting to listen on reference monitor speakers for a more accurate mix, then you will need an audio interface! 1/4″ TRS speaker cables will be needed to plug these speakers into your audio interface! If you’re wanting to record with high quality microphones using XLR connections, then yes, you’ll also need an audio interface! So Just What is An Audio Interface? An audio interface is an external sound card that we plug in either with a usb (usb-c soon! ), firewire, or thunderbolt connection. It allows us to connect high quality microphones and reference monitor speakers into our computer directly, and takes card of all the analog to digital conversion (D/A and A/D conversion). They allow you to also plug in instruments and have preamplifiers to have full control over your recorded signal! Most of these audio interfaces come with 48V phantom power allowing you to use condenser microphones. Audio interfaces also allow you to select the quality of the recording, whether that be 16-bit 44.1kHz, 24-bit 44.1kHz, or jumping up to 24-bit 48kHz. It’s just a matter of selecting it in their audio settings software! When you see an audio interface and it says 2×4 or 4×4, this means 2 inputs and 4 outputs, or 4 inputs and 4 outputs. This tells us how many connections the audio interface has. I find this is a bit deceiving because for those 4 outputs, you may assume they are all 1/4″ TRS connections, but the other two could be RCA! But for the inputs, most of these audio interface use what is called a Neutrik Connection, and this is awesome! Neutrik connectors allow us to plug in either XLR, TRS, or TS cables through the same connector! Also, audio interface companies create ASIO drivers for their product, allowing for lower latency and easier recording for the end user! So that’s a run-down on what an audio interface is, why it’s beneficial, and why you’d want to purchase one when having a home studio. 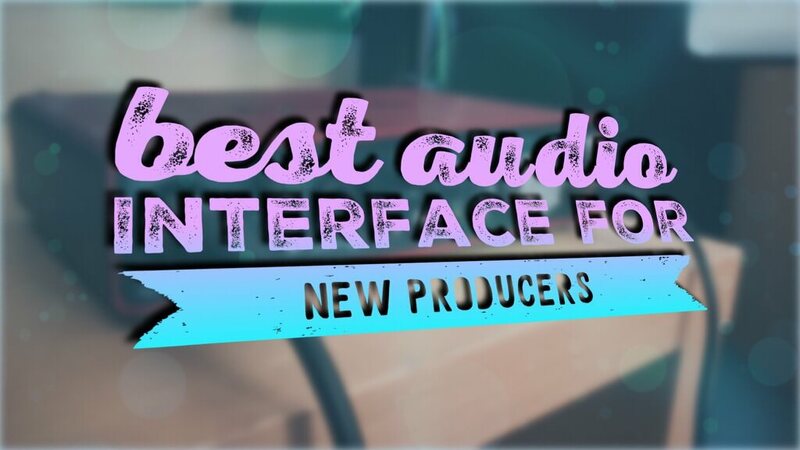 Here’s a list of some of the most popular audio interfaces on the market right now for new home studio producers. I will first start with what I’m currently using! I have been extremely happy with the Focusrite Scarlett series of audio interfaces. I’ve owned the first and now the second generation, which is definitely new and improved! 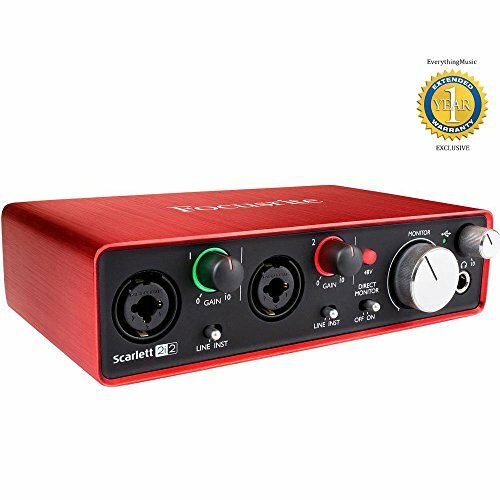 What I really like about the Focusrite Scarlett audio interfaces is that they just work as expected – you pay for what you get. Their halo lights around the volume knobs indicating red if distorting or green if your volume is good is such a genius idea and works so well. The build of the audio interface itself is very rugged and will last you for years! And now that their second generation is offering extremely low latency, this is the audio interface I suggest to both new and seasoned producers. So how Many Input/Ouput Connections Do you Need? Most audio interface companies release a range of the same series which lets you choose how many connections you need (inputs and outputs). If you’re a beatmaker just recording a single artist at a time, you can easily get away with something like the Focusrite 2i2! Later on, you may get some additional hardware, and that’s where an audio interface like the Focusrite Scarlett 2i2 will limit you, even the 2i4 of the Scarlett range doesn’t allow for tons of routing flexibilty! But you just have to think about where you are at right now. You can always upgrade down the road once you learn what you need to get your job done! This is something I would of liked to of known in my beginnings, I just didn’t know companies did it! Companies often offer bundles deals with their audio interfaces. I’m not talking about free software, I’m talking about headphones, microphones, sometimes speakers and audio cables too! It’s an amazing way to save money, and still get the quality you’re after! So, here’s some bundles I’d recommend! 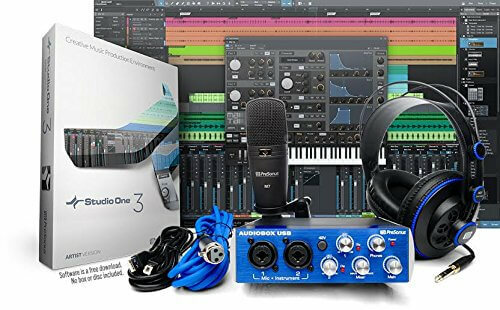 The Focusrite Scarlett 2i2 Studio Recording Bundle is an awesome starter kit to the new producer! This will get you up and going in no time! You’ll notice I went with the 2i2 over their Solo series. This is because the 2i2 series allows you to plug in your reference monitor speakers with their 1/4″ inputs. The Solo series only has RCA! 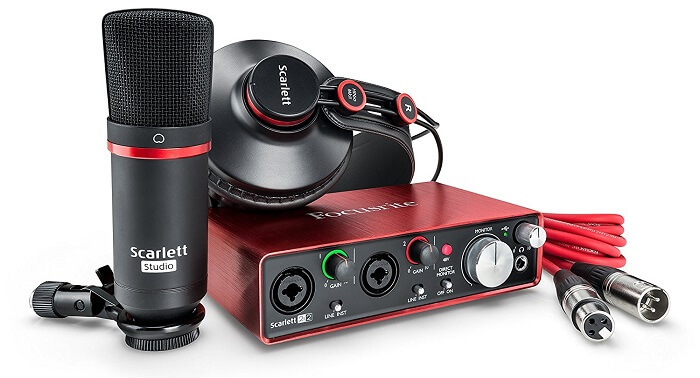 You’ll also notice I made sure to direct the links to the 2nd generation of the Focusrite Scarlett series! This allows for lower latency and supposedly better preamps! 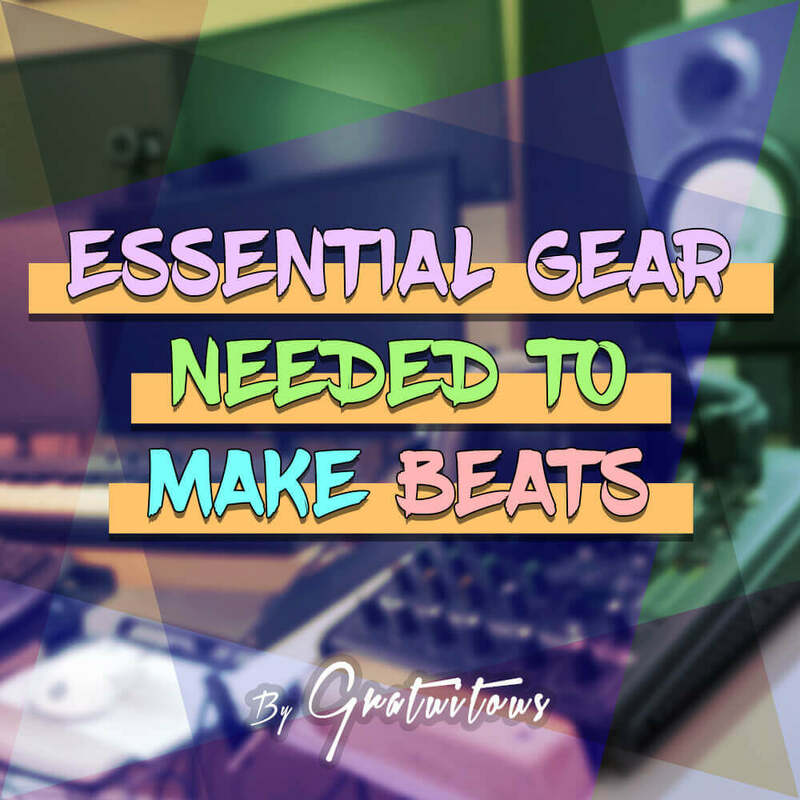 You will be able to record with your high quality audio interface, condenser microphone, and a decent pair of headphones to get you going! You save a lot of money going this route. This is definitely another bundle to consider. These two brands, both Presonus and Focusrite, are definitely industry leaders in this audio interface game. Again, the savings from the bundle is such an awesome deal! So that’s what I’d currently recommend to get you started. These companies do update their products from time to time, as you read about 2nd generation products etc. So always be on the look out for that. The most important features I find in an audio interface is having enough inputs and outputs for flexible routing, having low-noise preamps (cleaner recordings), and awesome ASIO drivers which allow for low latency in your DAW. If you have ANY QUESTIONS – just comment!